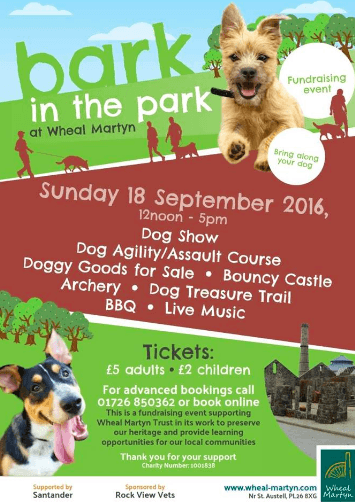 Bring your four-legged friend to Wheal Martyn on the 18th of September for the 'Bark in the Park' fundraising event. Supported by Santander and sponsored by Rock View Vets this fun filled, family day out will include a dog show, agility course, treasure hunt, stalls, entertainment, BBQ, bouncy castle and more! Tickets cost only £5.00 for adults and £2.00 for children. Dogs go free!